The retraction is 1.8mm at 50mm/s as its an E3D v6 genuine but a flying extruder so my bowden tube is only 15cm. That's very close to what I've settled on for my flying extruder setups. i'm at 2mm at 40 mm/s on my mini, and 2.3mm at 40 mm/s on my XL. Both are tuned to be as good as I can get them, and I'm happy with the results. The XL has a longer bowden tube, and this changes the optimum length of retract. btw the best filament I've found for tuning is matt light grey ABS, it shows every tiny little issue. It's easier to photograph as well. If you mainly print in PLA then obviously use that, but I mainly print in ABS so it makes sense for me to tune for that. Also note that you have some lower wall cave-in on the part, visible on the tower you printed next to the benchy. I found this almost impossible to remove when using using Printbite, due to the high temperature required for adhesion. Perhaps try lowering the second layer temperature to 105 degrees. It won't eliminate it but should help a lot. Also a very light layer fan really helps with ABS, you want the speed where your fan is just ticking over. This is 8% on my mini, and 5% on my XL. Wait till you try 3500+ its start to get crazy fast, I think I have to play with jerk a little since my circle are very bad at that accel , its like its stopping at each little section of the circle. If you have the original CAD model, you can generate shorter segments when rendering small circles and tight curves to STL to avoid the need for higher jerk. Edited 1 time(s). Last edit at 10/31/2016 05:52PM by dc42. @ Nebbian, yes I certainly see what you mean with the lower walls. I reckon could go down to 105 for layer 2, as the parts don't noticeably detach from the Printbite until about 75 Deg C.
I have some silver/grey ABS might try that, I mainly print ABS like you so PLA is not that meaningful. I will try the low power fan with the ABS its easy enough to do. I always make my own model and usually make my circle a least 32 side for small circle and 128 + for bigger one but the problem I see it while I was trying to print a benchy at 150 /3500 the brim/skirt did a very bad job in circle and those you cant really refine. I will do more test today if I have time and maybe will post them on my thread since I feel im hijacking DjDemonD thread a little bit with that quest for speed. Go for it this thread is about tuning now, and I want to tune for reasonable speed as well as quality. So got my magnetic arms from Haydon Huntley. Big improvement over the k800 version. Much more force required to disconnect the magnets, rods slightly longer, Delrin cups for low friction and long life and smaller balls. I haven't done any high jerk/acceleration testing yet, but I'm much more confident than with the k800 setup. Interestingly calibration precision is about the same, although the rods are almost certainly more precisely matching in length than my extended k800 rods, I'm now using ABS carriages and effector which have noticeable, if slight, play compared to the metal versions. We need a metal version for Haydns setup. Edited 2 time(s). Last edit at 11/16/2016 12:02PM by DjDemonD. Man, I love this build... Every time I come to this thread, I'm super impressed with your machine and drool over your prints and speeds. Would it be possible for you to set up a running BOM as you modify and tune your machine? I'd love to start planning an identical machine. Thanks but there's a good bit of testing to do before I'm completely happy with it. I will try to do a full BOM. I've half moved onto the next project which is a super simple to build micro-delta. But I've no idea if it will work as I'm building/designing the first one now. Here an Idea for your carrier ultra light weight, you can use a small .125" aluminum plate just enough height to get your top bolts of your carrier in and give it a bend to 45 degree over the top. then cut it a bit to left only 2 little 45 degree tab enough for your bolts and balls. If I had to replace the rods I made ( check my build thread), this will be what I will do kind of the same style as my effector but on the carrier. Btw I did a couple of speed test and decide to settle on 3200 accel and 1800 jerk (30mm/sec) Print infill at 140 mm/sec and last wall at 60% and top/bot infill at 50%, the quality is good, past that speed the extruder go too far and I end up with bad corner if I have some 90 degree in a part, for circle part only I push more on the speed side no problem there. Edited 1 time(s). Last edit at 11/16/2016 03:32PM by GroupB. Yes I think if I had the metalwork skills myself I'd cut and fold an effector and carriages. I don't but its an idea for sure. Okay so finally able to print fast without arms flying off all over the place. This cube (0.2mm layer height) printed at 60mm/s perimeters in slic3r, but at speed factor 300% acceleration 3000. Its 40x40x20mm so probably not near the theoretical speed. But it took 28 minutes at 10% infill. You can see at the corners as the layers build up, where I started at 150% speed, then went to 250% until about 2/3 of the way up then to 300%. It definitely shows the deceleration required to to go around the corner, its very similar to Digital Dentist's post about his corexy with the pen attached, where you can see under the microscope the little bulge before the corner. Edited 1 time(s). Last edit at 11/16/2016 04:35PM by DjDemonD. Mine at high speed and accel still do sharp corner (no bulge) but they overshoot a little, they go too far before changing direction. You dont need metal working skill to cut a small piece of .125 plate and bend it, I always cut my .125 with a jigsaw and bend into a vice with some wood on each side. How close to vertical do your arms get at any Point. I have got my set of rod ends and balls from Haydn and can safely say the even if the Balls are mounted flat on the Effector and carriage then you can get to 90 degrees arms to center line of the balls so I reckon a CNC'd Plate with the holes in the right place would do the Job. As soon as I can get My CNC Commisioned I intend to try some in Acetal sheet and failing that My Brother can do Alluminium pretty well so may get some 8 or 10 mm Ecocast plate and get him to do me some in that. What do you think (could gat a pair done just as easy as 1. I have designed and effector to have 60 mm spacing between the balls (My printer will have 750mm long arms) Which I have printed in PETG so just need to do some carriage parts now? Yes I'd happily chip in for a metal effector, if the carriages are in the works too. Would 60mm spacing be ok for yours or would you want it reducing also the balls would have to be flat as machineing them at 45 Degrees needs better kit then we have Would prob do the Carriages in 3mm ally and bolt on the old style carriers just for the Belt clamps? I'll measure the spacing when I get home later today Doug. Yeah the flying extruder kind of does the same thing, but the issue with k800 was the magnets are not strong enough and the angle of arm to effector becomes too acute at times and they disconnect, under these conditions the spring probably makes it worse. I cannot recommend Haydn's magnet arms enough, they are very good. I ordered a set of Delrin rod ends and Balls from Haydn and can honestly say his service is second to non (I would have got the arms complete if it wasn't for the fact I need them to be 750 long). think total cost for 12 Balls plus 12 Delrin ends was $27 plus 14 for Airmail postage so $41 total and they arrived in less than a week so well happy (Haydn also included 2 std 3/8 balls to use as part of a jig for assembling the arms) there Found some N50 10x15lg magnets on Ebay for under £8 for 20 then found some 800 lg lengths of CF Tube on Ebay for around £4.50 ea so am ready to assemble them now but in no rush as haven't got everything together yet to complete the build anyway. ps I agree the angle at the effector's farthest reach would prob make the weak magnet effect worse as you would be applying even more side load onto those magnets? Edited 1 time(s). Last edit at 11/17/2016 09:23AM by dougal1957. Well was just about to take the 1 hour speed test with this object [www.thingiverse.com] when the insane WTF fan died on me and the hot end jammed. So it seems these fans are good but perhaps only have 30 hours in them, and I'm only running mine at 3.5v not 8.4v as it is advertised. Luckily plenty of spare fans about. Nice build log! I started building a delta and I would like to ask you more details about calculating the arm length. In your case I see that the heat bed size is bigger than the incircle of the triangle base and smaller than the excircle of the triangle base. Are you able to print on an area bigger than the incircle? The geometry of a delta printer is complex. I found several OpenScad files that are simulating the calculations and also another drawing showing the same. 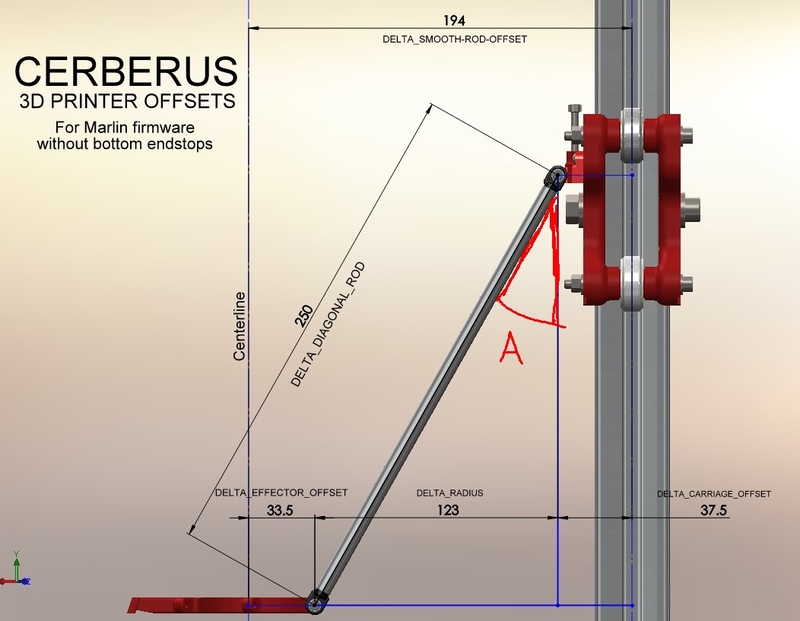 There nothing to calculate really, the best way is get into cad and do the arm, 2 rule to try to respect here, 60 degree when effector are in center and 20 degree when you trying to print away from a tower, horizontal arm dont work well. You dont need to be exactly 60 degree or 20 its a ballpark really. Printing outside the tower really depend of the arm lentgh (20 degree rule again) and the spacing between the carrier and the pivot at the carrier so arm can swing sideway and the type of pivot you got, magnetic ball allow a lot of degree all around, not something possible with RC Cars pivot. But my opinion is its better so stay inside the tower there less danger of disconnect because you went too far on ball/magnet angle. I used this [www.thinkyhead.com] but bear in mind it's only a model and it's not totally accurate. Whatever length you decide add 10-20%, many of us have wished we have longer rods, I've just gone from 340 to 360mm, but I've never heard anyone say they want shorter rods. All you lose is a bit of Z height which with a delta is no problem as you have ample to begin with. Yes you can print outside of the towers with relatively long rods for a given frame size, I wouldn't position an object near the edge deliberately, the resolution and speed are affected at the extremities, but if an object has to stick out to the edge of an oversized bed then it can work. I think as my first delta a kossel mini had an oversized bed I just find deltas with beds within the towel radius odd. Edited 1 time(s). Last edit at 11/18/2016 09:05AM by DjDemonD. It will be updated if anything substantial changes. So an epic print to put here, at least in terms of size, the largest footprint object I've printed so far 20cm x 15cm. In ABS too with no enclosure. Some sort of parts tray I printed for someone. Yeah thermistor temp is 120 deg C, the bed surface is around 110 deg C measured. Print 1st layer ABS at 250. Seems to work fairly well, usually use brims/mouse ears depending on the model. what are your first layer settings, like speed, width, height? I would expect the same surface matrial to perform similar even with minor filament quality issues. I print first layers at 20% of approx 60mm/s, 150% extrusion width, at 0.36mm height (plus the thickness of a piece of paper). In my experience mouse ears at the corners work better than brims. Brims pull away the same as perimeters, but the forces seem more favourable with mouse ear pads at the corners, I've rarely ever seen one lift. I have another machine with a chamber and the difference is huge, one corner can be just disconnected but there is barely any warping so the part is often perfectly usable. Hm, this is quite much slower and thicker to what I use (30mm/s, 0.3mm (zero nozzle offset), but at 200% layer width).